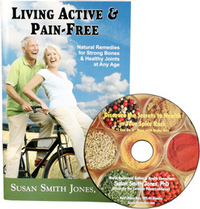 Living Active & Pain-Free: Natural Remedies for Strong Bones & Healthy Joints…at Any Age by Susan Smith Jones, Ph.D. Plus Bonus CD - Penn Herb Co. Ltd. The healing herbs from nature's medicine chest can help stave off the degradation of bones and joints, minimize pain from arthritis, and help you feel years younger. Read this booklet and don't take the aging process "lying down"! FREE CD - DISCOVER THE SECRETS TO HEALTH IN YOUR SPICE RACK: Dr. Susan discusses the curative powers of today popular kitchen spices and how you can use them to heal.